I feel blessed to have amazing relationships with both my parents. My parents were junior high sweethearts who came of age in the late ’60s, early ’70s. Like most couples, they’ve weathered a ton over the years (including our house burning down when I was 8, the deaths of their parents as well as my beloved uncle Howie, to name a few challenges they have faced together). And in the process, they’ve produced three pretty cool kids — or so they tell us 😉 Though all of us have long fled the nest, we’re still extremely close thanks to frequent flyer miles, cell phones, e-mail, and Skype. (I’m in Michigan now; my brother lives in L.A. – but now he is teaching English in South Korea for the next year – and my sister lives in Manhattan where she’s a social worker at a NY Hospital). 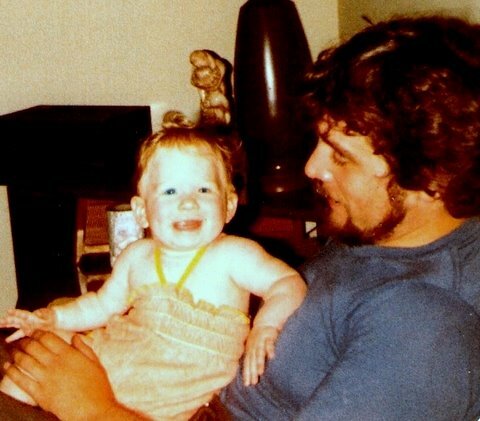 But in many ways, no matter my age (I’m almost 30) or even the fact that I’m married now, I’m still Daddy’s Little Girl. I’m the eldest of three, and I swear, sometimes I think he still thinks I’m five, wearing pig-tails! But my dad has never been the kind of dad to spoil me with physical objects the way some girls’ dads might. I don’t have a special pair of Tiffany earrings he gave me for graduation, or a car he bought me like a lot of the girls I went to college with (I’m not talking about my friends, just lots of girls I knew at American). Instead, he’s spoiled me with his unconditional love, admiration, and devotion … something I wouldn’t trade for anything in this world. In that sense, I’m definitely a daddy’s girl. My dad worked two jobs when we were small so my mom could stay home with us. I’m super-thankful for that. In spite of his crazy schedule (he was a printer), as a baby, we still always had our special time. He’d wake me when he got home at 3 in the morning from work so we could spend time together while my mom slept. He’d read to me, listen to me babble, and put me back to bed. 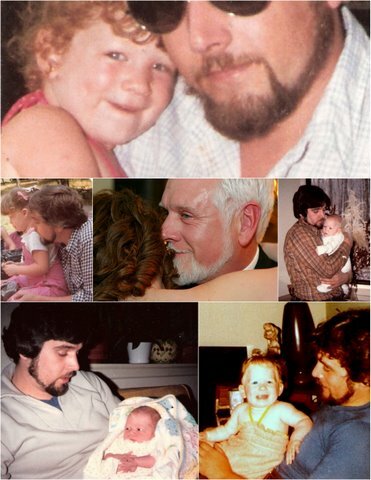 Anyway, in case you can’t tell, in honor of Father’s Day, this entry today is devoted to my dad. Pardon me while I take a walk down memory lane today. One of my favorite memories of my dad is that he rescued Octy — the six-legged blue stuffed octopus he gave me the day I was born — from our house fire in 1988. (Blue because my parents didn’t know if I was going to be a boy or a girl, so he picked blue to be safe). Anyway, we came home from shopping around 5 p.m. on Saturday, January 9, 1988. My dad opened the door and literally screamed “FIRE!” — and our lives were forever changed. An ember from our wood burning stove had escaped and caught on an ottoman in the living room … I was at the top of the driveway crying with my mom and siblings … we did what he told us to — ran to our neighbors and called 9-1-1…we watched the scene unfold from our neighbors’ living room window, staring in disbelief at what was our life as we knew it, gone in an instant. The fire department told us had we come home ten minutes later, the house would have been gone entirely. We lost pretty much everything, and were out of our home for about six months while it was rebuilt. The only things my dad could salvage were my parents’ wedding album, some photo albums, and Octy. Octy still sleeps on my nightstand to this day; I hope to pass him along to our firstborn child someday. Irony of that day? That morning before we left to go shopping, no joke, I’d asked my dad, “Daddy, what would happen if our house ever caught fire at night? !” He told me we’d find each other and meet out by the mailbox and run to our neighbors and call 9-1-1. We came home, and yea, the house was on fire. We ran to our neighbors and called 9-1-1-. He swears it was just female intuition, but for many years I felt a sense of guilt for my premonition of sorts … and I am still to this day very funny about fire. Our family is forever bonded because of that trying experience. Whenever we wonder, “Why us?” we know there was a reason, somewhere. Never really into sports, my dad came up with other creative ways to bond with his kids. He took us on “winter picnics” in the woods behind our house, would make tents in our living room so we could “camp,” and made us the best waterslide in all of Vernon, N.J. (“Slippery Banana” — a huge tarp that worked SO much better than the “slides” you could buy that always ripped on us). While my sister and I are tone-deaf and have no musical ability whatsoever (thanks, Mom, we get that from you!) … my brother clearly got his musical talents from my dad; my bro can hear a song and play it on the piano or guitar or sax within minutes, without sheet music. If someone asked me to sum up my dad, I’d say he truly epitomizes the notion of living for his family above all else … nothing makes him happier than being with those he loves the most. OK, full disclosure — he lives for his family, and the Weather Channel! When I lived in Argentina or El Salvador, he’d call to tell me about the weather patterns coming that week, or about how he saw “me” (ok, my current country!) on the satellite imagery on the NASA channel. While I might not chat with my dad for an hour like I do with my mom, our phone time is very special to both of us, especially with me living far from home. Though I’m the first to admit I wasn’t always the sweetest thing as a teenager towards him (who is!?! ), today, he is a dear friend and confidante, and I’m so blessed to have him in my life. 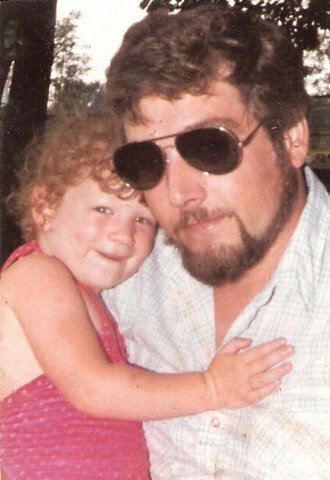 Because of our close relationship, I know it killed my dad to learn about my body image issues and my history with disordered eating. I imagine as a parent, it has to be a terrible feeling: to know you are not able to “fix” your son or daughter’s “boo boo.” That reality can’t be easy to swallow. When he’d see me every few months over the course of the year I lost weight (2004) when I’d visit NJ or my parents would come to D.C., he was definitely encouraging, seeing my confidence levels shoot up as I slimmed down. But, like my mom and husband — he also never hesitated to tell me I was beautiful no matter what, and I think that is important to note; I only felt pressure from MYSELF to be thin. In fact, at one point, he worried I was too thin. Not surprisingly, that was not a maintainable weight for me. (10-15 lbs above really was, a little less than where I am now). Anyone who knows my dad knows he is very much a black-and-white thinker. So in his mind, it’s hard to conceptualize — let alone understand — how this all came to be for me, or why his little girl could be so self-destructive … and above all, how he could have been in the dark for so long. It made him sad to know what I was going through, and though he can’t understand all of it, he’s been a great support through all of this. In Dad’s eyes, I’m perfect as I am, and I feel lucky for that. My dad has always been the kind of dad to see my mom, my sister or I walk downstairs and give us a hug and tell us how pretty we look. And though mothers tend to have the most influence on young girls and their perception of their bodies, I am a firm believer that dads matter, too. (Dara Chadwick also touches on this in her book, You’d Be So Pretty If …). Some girls have fathers who harped on them for their weight, or “teased them,” making them feel bad about their bodies. Other girls might have developed early and gotten unwanted attention too soon. But my dad never made me feel anything but proud of who I was, or how I was growing up. 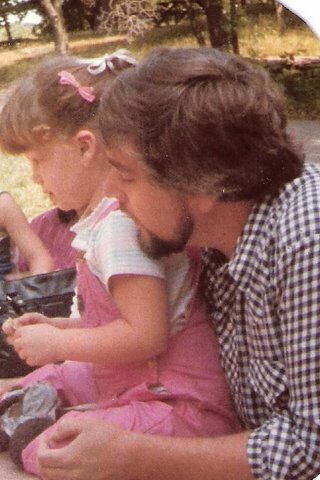 Though he wanted to probably keep me in pigtails forever, he saw his little girl growing up and knew there was nothing he could do to stop it. Even at my most awkward phase (age 12) when I was “compressed,” (as we like to call that phase where I was chubby only because I hadn’t grown taller yet but had started developing) he always told me I was beautiful. Even in that hideous neon orange “Hot Hot Hot” dance costume none of us will EVER forget. I didn’t have my first boyfriend til I was 16; I was everyone’s “good friend.” But I always knew I was beautiful in someone’s eyes, and I really believe that helped my confidence levels during those formative years when I wanted more than anything to feel pretty. When I was little, I used to dance on my dad’s feet; swaying to Sting or the Beatles, I felt like queen of the world. Those were some of my favorite childhood memories … Saturday mornings spent dancing on his feet. But I have to say, when my dad and I danced to “Sweet Melissa” (a song he sang to me as a baby) at my wedding in 2006, it was one of the most special moments in my life. And that tear in his blue eyes you see in this picture of us during our father-daughter dance at my wedding? That’s my dad, for ya’! I know my dad wants me to be happy and healthy, and I’m on this journey for my family (and future family) as much as I am for myself. My parents raised me to be a strong, independent, healthy woman … and I want to always make them proud. So today I want to say to my dad, Happy Father’s Day! I love you so much. Thanks for always being there for me and helping make me who I am today. I am a very lucky girl to have such a special, loving, amazing dad. Enjoy your special day, and hope to celebrate soon! 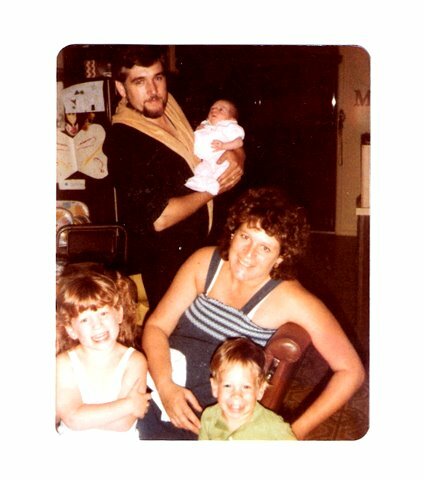 PS–Special thanks to Mom for scanning these old photos and for the adorable photo montage!! What a beautiful tribute! I have tears in my eyes right now! Aw thanks, Lara and Allison!! Smooches! Adorable post. Made me call my father again. Gotta remember father’s day. That is the sweetest post ever, Melissa! I have a similar relationship with my Dad. We are both very blessed to have such good men in our lives. Thanks for sharing that. Thanks everyone!! And we sure are, Staci!